Most of the time we are busy trying to just keep it tidy. The stolons of mint plants are some of the most aggressive in all the plant world. If you plant it in the ground, the first year you might wonder what all the fuss is about. The second year you find a few stray sprouts and by the third year it is climbing in the bedroom window. Mint will grow 20 feet under weedblock and come out the other side and with no water in mid summer. Mint plants spread two ways, by runners and by seed. Since most mint plants are hybrids, those sprouts that shoot up from the broadcasted seed will probably not be the same as the parent they came from. They will probably smell rank and taste worse. The spearmints or green mints are the ones most often used in cooking. They include Banana Mint, Mint the Best, Kentucky Colonel Mint, Curly Mint, Lemon Bergamot Mint and Macho Mint. The peppermints or red mints are very strong flavored and should be dried before using or used sparingly if fresh. 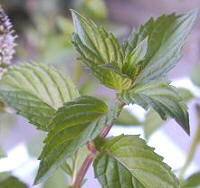 Peppermint contains menthol which spearmint does not. This makes the Peppermints the ones to use for soothing upset stomachs. They include Moroccan Mint, Orange Bergamot Mint, Chocolate Mint, Lavender Mint and, of course, Peppermint and its sport, Variegated Peppermint. The gray fuzzy mints are also excellent cooking mints. They include Egyptian, Habek, Apple and Pineapple Mint. While not scientific classifications, this method of referring to mints helps to understand them better and thus use them appropriately. Plant your mint where you can control it. Don't think just because you put it in a pot that is sufficient. Keep your eye on the pots too: mint can crack clay pots and escape into the neighboring area. Unless you want mint everywhere, grub out all those pesky runners that find their way into the soil as soon as possible. Once those runner's roots really take hold and the other plants grow around them, that space will be mint for life. Don't put more than one kind of mint in a pot. If you mix your different kinds of mints up in the same pot, either one mint will smother the rest or they will get so mixed up, it will be difficult to tell them apart. Mint likes full sun and lots of water. If you put your mint in the shade, it will grow floppy and the flavor will not be as strong as when you grow it in the sun. Mint is hardy to zone 5 and likes almost any garden soil. When you cut Mint, cut all the way back to the ground. If you want to enjoy the many different colors of flowers, cut them off before the seed is ripe. Remember that when an herb is flowering it is not making lots of nice leaves to cook with. 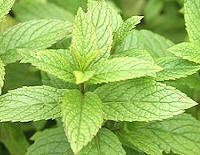 Shear your mint to the ground in the fall and it will emerge shining and ready for gourmand use in the spring. Mint grown in pots needs to be divided every year and repotted with fresh soil. It will fill its pot quickly and crowd itself out to the point of extinction. For more on repotting Mint, visit The Great Mint Caper Newsletter. Beat two of the eggs. Put the onion, meat, rice, oil, parsley, mint, salt and pepper to taste in a bowl. Mix well and bind with the two eggs. Form into 12 balls. Place in a shallow pan with a lid and pour water over the balls. Cover and simmer on low heat for about forty minutes or until the water has evaporated. Allow the balls to cool so you can handle them. Beat the remaining egg with the milk. Melt the butter in a frying pan. Dip the meat balls in the egg and milk batter and then fry until golden. Serve with plain boiled rice or saffron rice. This recipe is from Herbs with Everything by Sheila Howarth.